When we first moved to our place, we soon discovered the joy of cohabiting with ticks. Buy guineas, we were told by our friendly neighbors, as they do a great job of controlling the tick population naturally, without resorting to pesticide treatments. So we bought a couple of dozen pearl and lavender guinea keets (chicks). Among the keets, however, there were also two buff lace polish chicks that had been packed, by mistake, along with the keets. As it turned out, the chicks were a male and a female, so before long, nature took its course, and we were in possession of fertile eggs. 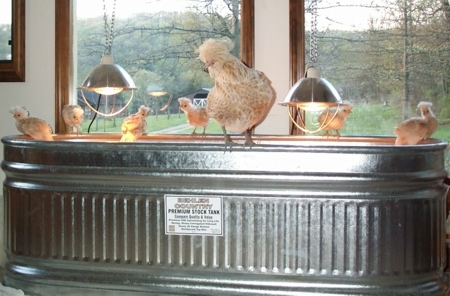 Retta, being the nurturer that she is, decided to buy an inexpensive incubator for these eggs, and whadayaknow, a few weeks later we were chicken ranchers. The young chicks soon grew into chickens, who roamed the grounds all around the house and barn areas, pecking and scratching for seed and bugs here and there. During the daytime, the chickens were free to roam as they pleased, and at night they always settled down in their coop, where we would lock them up for safe keeping until the following morning. Until the predators came! Hawks, coyotes, fox, raccoon, feral cats, stray dogs, owls …. they all came at one time or another. Before long, the flock was reduced in size dramatically. Until finally, we were left with two – a rooster and a hen. But now, sadly, we are left with only the hen, as some predator managed to kill the one remaining rooster we had this last weekend. It’s kind of sad, watching her – her demeanor in the coop leads one to believe she is truly mourning the loss of her companion. 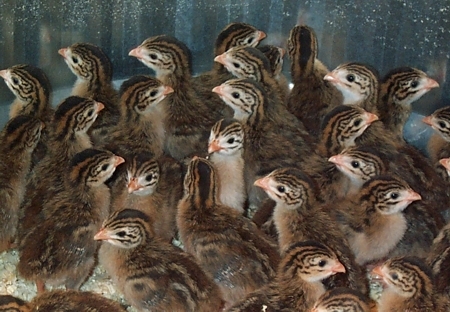 As we contemplate ordering some more chicks from a hatchery, we also muse on whether it is more humane to have the chickens live a longer life in captivity, or to allow them the opportunity to free-range during the day, knowing full well that they are destined to be picked off, one-by-one, by the predators that abound here. Do you find you loose them during the day or do predators manage to get into the coop? Have you had to chase off the predators (caught one red-handed so to speak)? I don’t own any firearms at the moment but I’m thinking I might need a rifle for such purposes? Or is it better to let “nature” take it’s course in such cases? We think we lose some at night to owls (the stupid ones who won’t go back in at night), but mostly, they get picked off, one by one, during the day. We have some hay fields around the house that we are going to keep short this season, instead of letting them grow for baling. We grow mostly fescue, which grows to chest height. If we let it grow for hay, then it becomes a perfect hiding place for daytime predators. We’ll see if that helps out this year. We had a possum (I think) poke its way through some chicken wire, and it got some of our guineas years ago, but since that time, we have reinforced the coop with hardware cloth. If you are building yours from scratch, I would recommend you use that to begin with. It will save you grief later on. Also, make friends with the crows. They are quite territorial, and will actually drive away any hawks that come into the area. Its fascinating to watch. As far as varmint hunting, I can’t give you much guidance, as I am not a hunter. I would imagine that one would have to be pretty well practiced with a rifle to be able to pick off these predators. And for any that you might happen to bag, how many others are there out there? How many will you ultimately have to shoot before you feel your guineas are safe? Also if you manage to eliminate the predators, who will control the populations of pests that the predators prey upon? Prey species aren’t always cute and cuddly, they can be a real menace to our health and welfare. Pingback: Ranch Ramblins » Blog Archive » Dang Rocks! 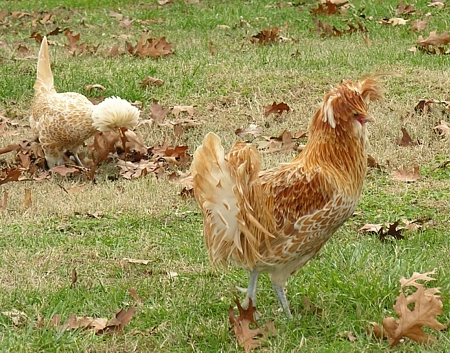 Pingback: Ranch Ramblins » Blog Archive » A Tractor for Chickens? Were your original 2 buff-laced-polish from Cackle Hatchery also? I’m asking since I like the looks of your flock and ordered some also. We have the same experience w/ the predators (hawks killed over half of ours so far), so we’re now building 30’x50′ pens w/ overhead netting for daytime. So far so good – they seem happy with that in-between lifestyle, but already one hawk squeezed into a corner somehow and got stuck in there. It was lying on its back so I thought it might be near-dead, but then I pulled the hawk out (not thinking – with bare hands) and accidentally touched it’s foot w/ my hand (just barely touched and it sliced into my hand much more than any knife could ever do (even the $100 knives), so now I won’t do that again! The hawk was still on its back for a minute after I pulled it out, and then it just flew off in a flash. My daughter said it was the most beautiful thing she ever saw (the hawk). Hard for us to have these mixed feelings about them when they’re just part of nature too. 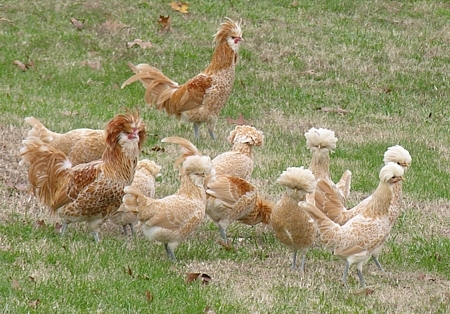 Our original buff-laced-polish chickens were purchased from a man selling chicks and keets outside of a local hardware store. 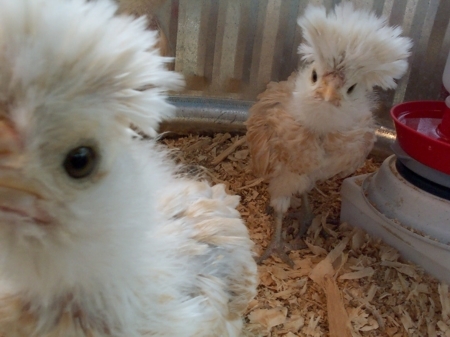 Since then, we have purchased all of our chicks from Cackle Hatchery.